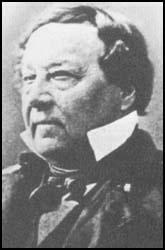 Benjamin Bonneville was born in Paris, France, on 14th April, 1796. His family emigrated to America in 1803 and Bonneville was educated at West Point. In 1832 Bonneville was granted leave from the army to "gather data on the topography of the region west of the Rockies and the north of Mexico". He spent three years in the Rocky Mountains and built a trading post on the Green River. Bonneville recruited Joseph Walker as his field commander and the party spent two seasons trapping beavers on the Salmon River. In 1833 Bonneville suggested to Walker that he should take a party of men to California. The beaver appeared to be decline in the Rocky Mountains and it was thought that new trapping opportunities would be found in this unexplored territory. Walker and his party of forty men left Green River on 20th August, 1833. The journey was a great success and Walker's party became the first Americans to explore the Yosemite Valley. On their return trip Walker discovered a good route through the Sierra Nevada mountains (the Walker Pass). Bonneville twice led parties to the Columbia River in Oregon but on both occasions he was forced out of the area by the British owned Hudson's Bay Company. In September 1835 Bonneville returned to Washington. Later he saw action in the Seminole War in Florida and the Mexican War. He also took part in the Vera Cruz expedition under Winfield Scott. He took part in the occupation of Mexico City but was court martialled for "misbehavior before the enemy". Bonneville spent time at Fort Kearny and Fort Vancouver before being given command of the military department of New Mexico. He retired in 1861 but was recalled to duty during the American Civil War. In 1865 he was promoted to the rank of Brigadier General. Benjamin Bonneville died on 12th June, 1878.